source in nature, which, for Mourtzakis, is a crucial part of his imaginative and emotional inner life. The richly textured surface of the drawing attests to several concentrated sessions of re-working over a period of five years, revealing the extensive layers of drawing, erasure and re-drawing, characteristic of his approach. 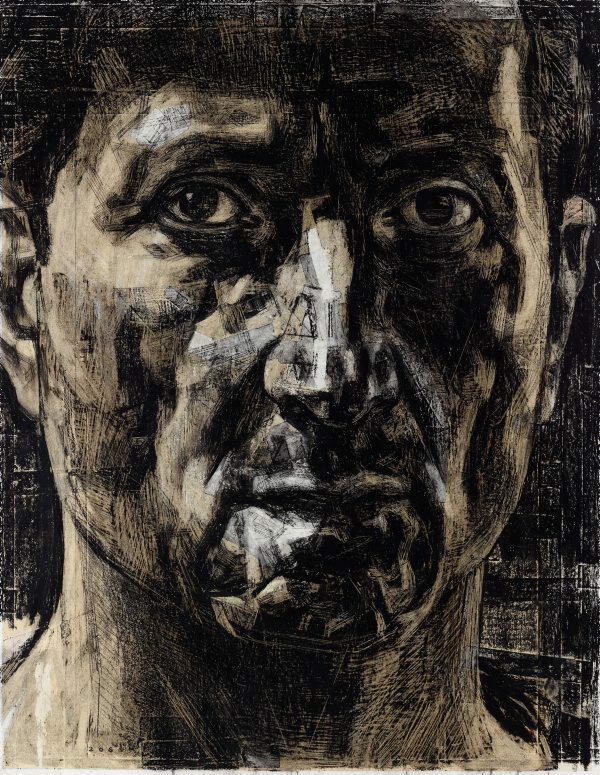 His geometric rendering of complex facial forms also reflects Mourtzakis’s longstanding interest in analytical cubism. This work won the Dobell Prize for Drawing in 2006 and was acquired by the Gallery in 2006. Signed and dated l.l., black wax crayon "NM", lithographic crayon "206"
Elizabeth Cross, Look , 'Nick Mourtzakis', pg. 18-23, Sydney, Jul 2007, 19 (colour illus.). Photograph of the artist standing in front of 'nature. insects plants flowers. shells fish corals. the microscopic creatures. dreams'. Elizabeth Fortescue, The Daily Telegraph , ‘Returning to nature’, pg. 92, Sydney, 29 Sep 2006, 92. Hendrik Kolenberg, Contemporary Australian Drawing: 20 years of the Dobell Prize for Drawing , ‘Introduction’, pg. 6-14, Sydney, 2012, 7, 46, 47 (colour illus. ), 61. Hendrik Kolenberg, Look , 'A fine harvest of drawings: legacy of an exceptional draughtsman', pg. 28-31, Sydney, Nov 2011, 30, 31 (colour illus.). Steve Meacham, The Sydney Morning Herald , ‘What makes a drawing? It’s often a fine line’, pg. 13, Sydney, 25 Dec 2011, 13 (colour illus.). Clare Morgan, The Sydney Morning Herald , ‘Artist’s blades cut his style to a winning edge’, pg. 3, Sydney, 25 Sep 2006, 3 (colour illus.). Mourtzakis is pictured standing in front of the work. Udo Sellbach (Editor), Imprint , ‘Dobell Prize for Drawing 2006’, Melbourne, Summer 2006, 27 (colour illus. ).